Cute, quick, and quirky--that's what these free seed bead earring patterns are! Easy earring patterns like these are perfect for the beader who wants a fun, fast project to stitch up in one sitting. They're small and simple, so they take much less time than a bracelet, which means you get to make more of them! And these beaded earring patterns are some of the cutest you'll ever see. If you like fun, whimsical jewelry, these earrings will be right up your alley. They're pretty yet playful, so they're as fun to make as they are to wear. 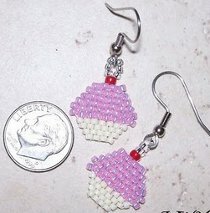 Once you stitch up these seed bead earrings, you'll be hooked! They're so quick and effortless, before you know it you'll be making beaded earrings for yourself, your friends, your neighbors, your mailman, and everyone you know. Check out the patterns below and get to stitchin'! Brick Stitch Cupcakes - These cute little confections are just too adorable for words! If you want easy earring patterns you can make in a flash, these are just what you're looking for. They're made using a simple brick stitch pattern, so if you're already familiar with brick stitch, these little beaded treats will be a breeze for you. But if you're just beginning to bead, they're still easy enough that you'll be able to follow along. Earring patterns like this one make such cute gifts. Whip these up the next time you need a last-minute birthday present! 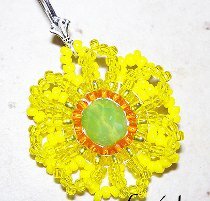 Seed Bead Sunflower Pendant -This is one of our most versatile seed bead patterns because it can be made into earring charms or a pendant--your choice! Simply add or take away beads to adjust the size. You can never go wrong with flower patterns. They're endlessly popular, and flowers never go out of style. Making beaded earrings as cheerful as these seed bead sunflowers is sure to brighten up your day, and your wardrobe! Make them in any and every color. 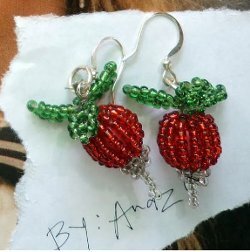 Luna Lovegood Radish Earrings - These eccentric earrings prove there are seed bead patterns out there for everyone--even Harry Potter fans! If you know Expelliarmus from Accio and Griffyndor from Hufflepuff, these are the earrings for you. Based on the radish earrings that Luna Lovegood sports throughout the series, these cute little tubers aren't for any ordinary muggle. This simple pattern will put you right in the middle of the magic! Earring patterns like this one are perfect for beginners, so whether you're a Harry Potter fan or not, you'll enjoy this quick and easy project. If you like these seed bead patterns, be sure to check out Making Beaded Jewelry: 11 Free Seed Bead Patterns and Projects for even more fun and fabulous ideas for seed bead jewelry!